Home > Central America > 1595 Petrus Alvaradus, Absente Cortesio Mexicanos sua sesta celebrantes strictis gladijs caedunt, atque monilia, quibus errant ornate, detrahunt. 1595 Petrus Alvaradus, Absente Cortesio Mexicanos sua sesta celebrantes strictis gladijs caedunt, atque monilia, quibus errant ornate, detrahunt. 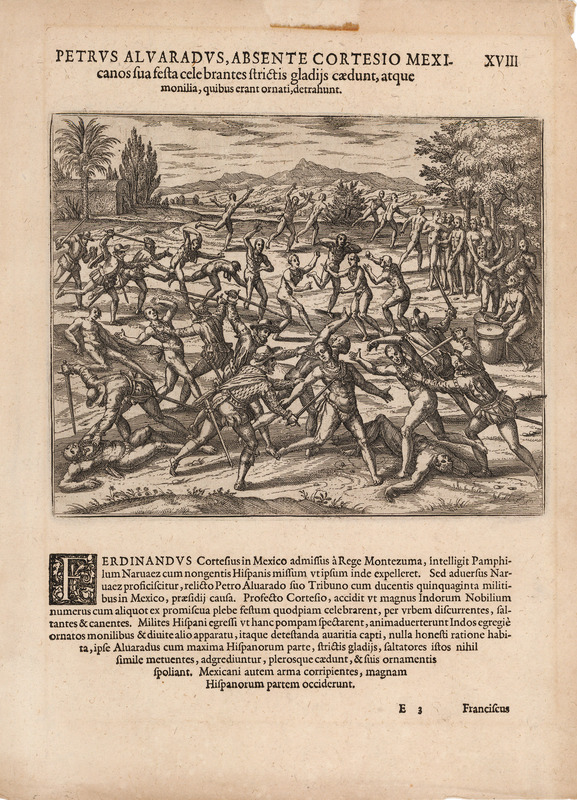 This early engraving by Theodoro de Bry depicts Conquistador Pedro Alvarado and a number of his swordsmen who, in the absence of Cortes, fell on a group of indigenous people during a celebration. Overcome by greed at seeing the valuable jewelry worn by the celebrants, the Conquistadors fell on and slew many defenseless people in the group, then stripped the fallen of their gold jewelry and other items of value. The engraving is described in Latin text below the image and is from Theodor de Bry’s publication, America. Condition: This engraving is in B+ condition.